In her new exhibition she explores national identity through the lens of an ageing and obsessed showgirl. 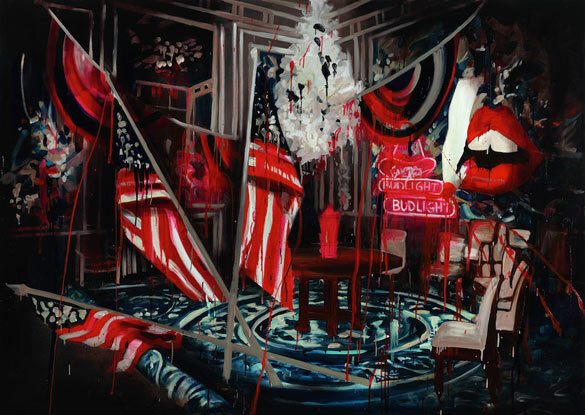 Rosson Crow's paintings — large-scale, dramatic and rendered in rich colours — are based on iconic interiors and historical events. But in her explosive aesthetic, places and the past become unclear, like trying to remember a dream from the night before. In her 2009 painting Reception Room with Bud Light the artist redecorated the White House entrance with dripping American flags, paint splatters and a neon Bud Light sign. "What I love about history is that it is not concrete," Rosson says. "It is misremembered and re-told and passed down, and there are many layers to what may have actually happened. It is the space between the facts that I am interested in." In her current exhibition, Madame Psychosis Holds a Séance, at Honor Fraser gallery in L.A., Rosson explores how significant historical events shape national and personal identities. In addition to several new and immersive works, the exhibition also includes a film about a middle-aged showgirl (played by Kelly Lynch of Drugstore Cowboy) obsessed with the Kennedy assassination, which Rosson co-wrote, directed and created the sets for. Film was a natural progression for the artist, whose work — oversized, theatrical and unpopulated — has often been described as a stage. "I like to make the paintings large enough so the viewer can enter and experience them," says Rosson, who also discusses her favourite filmmakers and opening-night outfits (which have included sequin leotards and feather headdresses) in the following interview. Can you explain what the exhibition is about? The show is about individual psychology and the ways in which national identity is shaped around moments of historical significance. The Kennedy assassination is an event etched into the American cultural consciousness and is still enmeshed in a web of confusion and contradiction more than 50 years later. In the exhibition and the film, I use this charged event as a narrative device to engage questions of individual identity, the power of emotion to confuse our sense of reality, and the human desire to connect to shared pasts while establishing relevance in the present. I wanted to explore this through the lens of a woman, Madame Psychosis, whose sense of herself is inextricably bound up with the events and conspiracy theories surrounding Kennedy's death, as she struggles with her connection to reality and questions her place in the world. Defining her identity through an iconic American tragedy, Madame's preoccupation with Kennedy's assassination obscures her true identity so much that she becomes convinced she is the reincarnation of the so-called "Babushka Woman," a key witness in the events surrounding Kennedy's death. What fascinates you about the Kennedy assassination? I have always been drawn to historical national tragedies, about historic events that are so powerful they change the psychology of the nation. I am also from Dallas so I think there is a psychic connection to it already. The Kennedy assassination is also so interesting because of all the different angles to it, all the conspiracy theories and varying accounts of what actually happened. Why did you decide to make a film for this exhibition? I have wanted to make a film for a long time; I just wasn't sure how to go about it. It always seemed like such a daunting task, so overwhelming. It just came together this year and I was able to make it happen. My boyfriend is a filmmaker and I think seeing him work helped me understand how to make these things happen; how to get great people involved. Which other films or directors are you inspired by? I love the work of Douglas Sirk, Todd Haynes, Agnes Varda, Michelangelo Antonioni, P.T. Anderson, Sofia Coppola, Alain Resnais, David Lynch and Hitchcock. Whenever I ask someone about their favourite filmmakers or artists, their list is made up of far more men than women. Do you think the art world is a boys' club? How do you navigate that? Yes, the art world is completely a boys' club, as is the film world. There has been a lot of talk about it lately, and hopefully, it is slowly starting to shift. But there are still galleries in New York who do not represent a single female artist! It's endlessly frustrating, but you have to stay focused on the work and keep proving yourself over and over again. In addition to making a film for this exhibition, you also produced works in a new blue palette. Why cyan? I wanted one of the sets to be completely otherworldly and surreal. At first, I was thinking that I could make an all black-and-white set, while the actress would be in colour. But I was researching ideas and came across some old cyanotypes from the early 1900s that I had collected. The colours immediately struck me, and I knew that this would be a much more unique palette to play with. You always wear something wonderful to your openings. What did you wear to the opening of this exhibition? I wore the costumes from the film. They were designed by Jeremy Scott and made out of canvas. I painted them with the same technique as the paintings and set objects, so they look like paper doll dresses. They worked out so well in the film-a play on the 2D as 3D, the real and the photo representation-like everything else in the sets. How did you and Jeremy Scott become friends? We met through friends in the art world. Jeremy is so inspiring; it is great to be able to witness his constant creativity, as well as his work ethic. We often go to flea markets or antique stores together, both of us rooting around for inspiration from the past. We both grew up doing that, so it's something that is really important to us. What's next? Do you want to make more films? Yes! I can't wait to make more films. It was immensely challenging and creatively fulfilling; I love being able to tell stories in a new way. Rosson Crow's 'Madame Psychosis Holds a Seance' is on view at Honor Fraser gallery through December 19th.